I have a question for the ladies out there, and those who have daughters. When did you get yours or your daughter's ears pierced? I know lots of people who get their daughter's ears pierced when they're mere months old. My daughter turns six next week, and she decided she wanted her ears pierced. This afternoon, that's exactly what we did. When do girls typically get their ears pierced? I don't have my own kid, but I remember my little sister only being a few months old, maybe a year when they did hers. I was nineteen when I got my King Eddy. I was 15, but my daughter was 10 (just in April) when I let her get hers done. I don't have my ears pearced. I never wanted that done and I'm already 49 years old. I don't believe in that kind of stuff. It's unnecessary. I don't have a kid so don't have to decide about my kid getting it done. I got them done on my 7th birthday! Back in the day with only one gun...........they do both at the same time now from what I have seen! I'm not female, but I had my ear done when I was 18. My fiancee had hers done when she was a baby. @Stephanie Wilkinson I got my left ear pierced. I haven't actually worn an earring in a decade, but the hole is still there. I'm with Cheryl. No holes or ink. What for? My daughter just turned 14 this week, and her present was her nose pierced...to young? 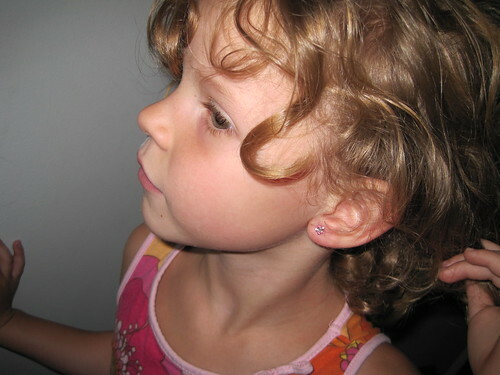 We got her ears pierced when she was 8. I'm planning on getting my first tatoo next year (my 50th) too old? I usually read you from work (through google reader) but I can't comment because of our firewall - which explains why you've never heard from me before. I've been meaning to comment for ages. I enjoy reading you, makes me feel like I'm somehow keeping in touch with home. Well, to be honest I skip the hockey stuff, sorry. I had my ears pierced when I was a baby (my grandmother did it and my mother flipped). My sisters were 6 and 13 when they had theirs done. The first ones were done when I was four. The second ones were done when I was six or seven. Both times were not my choice. Ironically, I barely wear earrings anymore, but my holes haven't closed up. So at least the one time a year I decide to dress up, with earrings, my parents still get their money's worth — 25 years later. My youngest sister is nine. I told her I'd take her to get her ears pierced when she wants it done. But so far not yet. Good on you guys for taking your daughter though, Mike. I know it's no longer a "no brainer" kind of decision for parents anymore. I was a baby when I got my first earrings (European traditions and all that). Probably 9 months old to a year old. I was 18 when I got my second holes - which got infected and had to close 3 months later because they were done with a gun at the mall. At 24 I got the second holes redone properly at a piercing studio with a needle. It was more expensive, but healed much faster, didnt hurt nearly as much and the knowledge that the piercing needles are a LOT cleaner than any gun in a mall made it well worth it. I havent had a problem since. Well, this is it. Why get something like that done. I don't believe in getting stuff like that done unless absolutely necessary. I got my first set when I turned 10 and the second when I was 14. They thought then I was old enough to deal with the work for them (cleaning, making sure they didn't get infected) without having to be reminded. I don't really understand getting them as babies. Seems too easy to get them caught or pulled. I got my first one when i was 12, and then the next when i was 16.. but im a guy. my sisters had there's done at like 4-5 if i recall correctly. Uh, elvis isn't talking about his ear. I refuse to Google what Elvis is talking about. My Spanish student told me hers was done the day after she was born. I was 19...but only by choice because I was afraid of the gun. My friends had to hold me down - it was my 5th of so attempt. I wish my parents would've done it earlier before I continually chickened out of it as an teenager. After going 19 years without anything in my ears, at 25, I think I look pretty ridiculous when I wear anything. "Well, this is it. Why get something like that done. I don't believe in getting stuff like that done unless absolutely necessary." Why colour your hair? Why wear coloured contacts? It's all relative, and a matter of perception. Piercings are safe - as long as you get them done properly. Yes, there's a risk in them...just like anything else in life. Baby girls in India have their ears pierced for their first little earrings. I once went along with my cousin sister when she wanted a second piercing on her ears. They used a gun, she was scared and squeezed my hand so hard that I think I had a hairline fracture. I've wanted to get mind done when I was 17 but we lived in stricter times in the 1990s and you rarely saw dudes in India with rings in their ears. In the last 5-7 years a lot of guys get their ears pierced and get studs in them. I never wanted my ears pierced, and I begrudge my father for making that decision for me. I might let that much go if he'd apologize for altering MY body. He started pestering me about it when I was six years old, probably because he was a single father, and he thought, "This is what girls are SUPPOSED to do." I said, "Okay, when I'm seven," think that was so far in the future that he'd forget. My seventh birthday came around, and I pitched a fit in the parlor. If I were running that parlor, I'd have said, "Take your daughter home; she is not ready," but those monsters did no such thing. They were just interested in my father's money. I haven't worn an earring since the age of ten, and they haven't healed properly. It's a HOLE in your EAR, also known as a scar. They still get infected and flair up, so now I'm looking for a doctor who will remove the scar tissue so they will heal. I WAS 16 ;D I LIKE EARING ;D I WASH HAND AND ALCOHOL TO CLEAN EARLOPE AND ANY EARING. LONG AGO, MY GRANDMOTHER PUT NEEDLE MY SISTER WAS 5 YEAR OLD OOOOH, I HATE PINCH!!!!! !